Speedy Tuesday! Today we have another Speedmaster Professional from one of our readers and avid Speedmaster fans, Darren. He submitted this limited Speedmaster Professional Apollo-Soyuz with meteorite dial. A special version from 2010 that commemorates the Apollo-Soyuz mission from 1975. The Apollo-Soyuz mission, or ASTP (Apollo-Soyuz Test Project), started at the 15th of July and they returned on the 24th of July 1975. 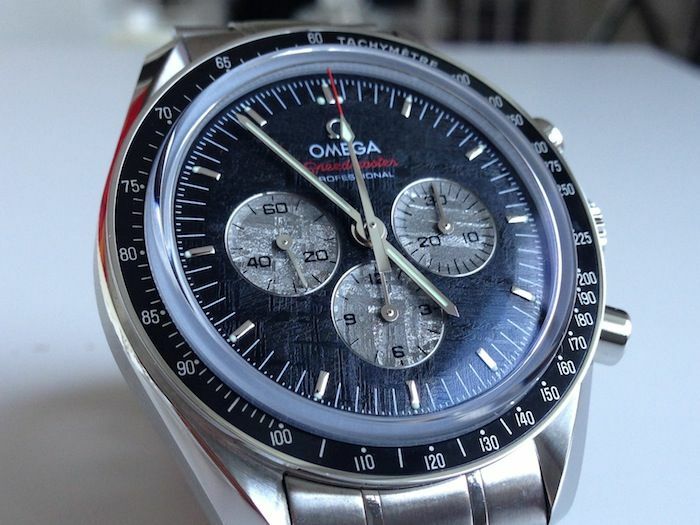 To commemorate this, OMEGA already had a Speedmaster Professional back in 1975, limited to 500 pieces and with the Apollo-Soyuz logo on 12 o’clock. Later on, in 1995 and 2000, OMEGA again introduced a Speedmaster to commemorate this special mission. The very first limited edition of 1975 (ref.145.0022) will really drain your bank account, as it is highly sought-after amongst collectors. In 2010, OMEGA introduced this ref. 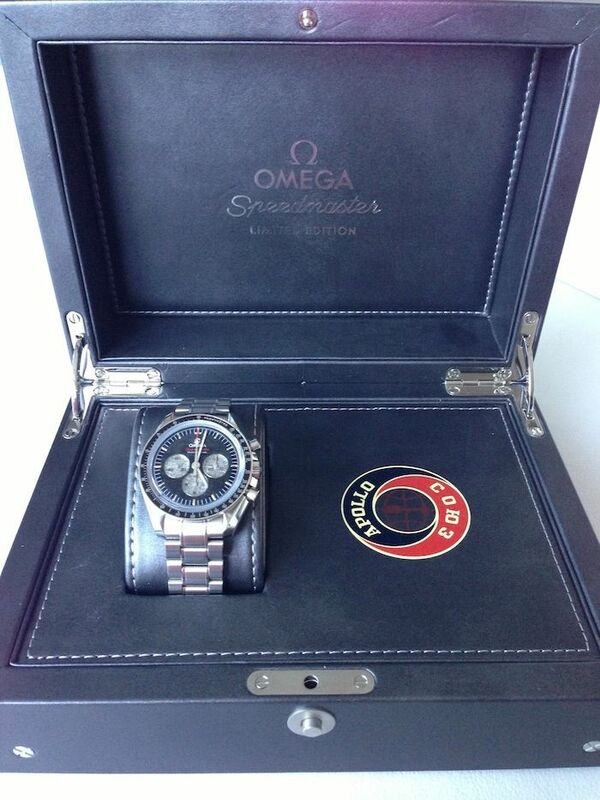 311.30.42.30.99.001 Speedmaster Profesional Apollo-Soyuz limited edition, with meteorite dial. In 2010, I wrote a review on this particular limited edition Speedmaster Professional Apollo-Soyuz “Meteorite” which had some background facts on the ASTP mission and previous ‘Soyuz’ Speedmasters as well. You can find the Speedy ‘Meteorite’ review here. I will stick to the photos and few facts for this article. The coolest feature on this limited edition (to 1975 pieces) Speedmaster Professional Apollo-Soyuz is the meteorite dial of course. This, together with the special engraved caseback are the major differences with a normal ref. 3573.50 Speedmaster Professional. Of course, as you can see on the pictures, the hands are also slightly different. Not a single dial will be the same, as the structure of the dark colored stone varied per cut. At some point, the list price of this Speedy Meteorite was just over 6000 Euro. This and the fact that there were only 1975 of them, make it quite an exclusive appearance. In the pre-owned market, I’ve seen them on Chrono24 starting at approx 5000 Euro / 6300 USD. 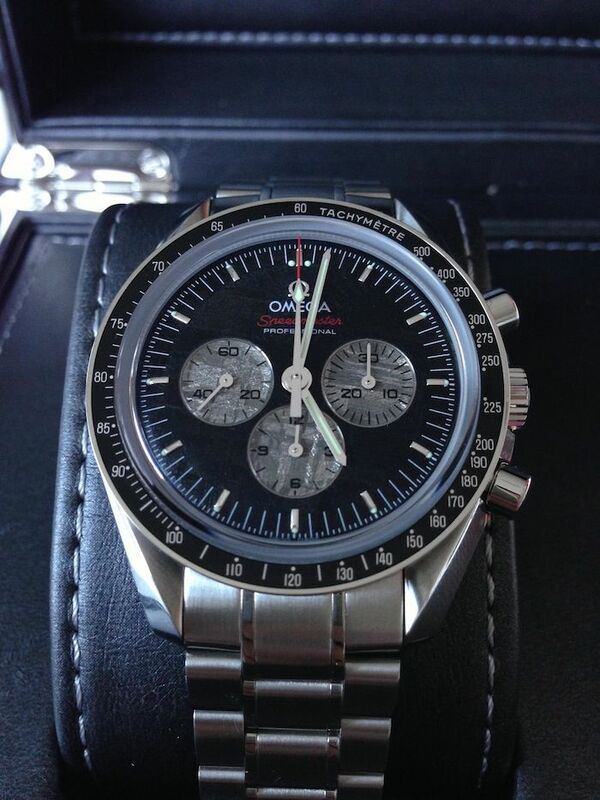 Is it worth the extra money compared to a ‘standard’ Speedmaster Professional with sapphire crystal? In my opinion certainly, as this will be a (future) collectors item without a doubt. Especially since the dials are unique for each timepiece, it is certainly something special. So if you have one, keep on to them. The caseback of this Speedy Apollo-Soyuz has a very interesting engraving, or embossed picture would be a better description. It shows the actual docking of both space crafts and shows the Earth and Sun. The names of the Russian cosmonauts and ‘Soyuz’ are embossed in Russian language, where the NASA names and Apollo name is embossed in English. 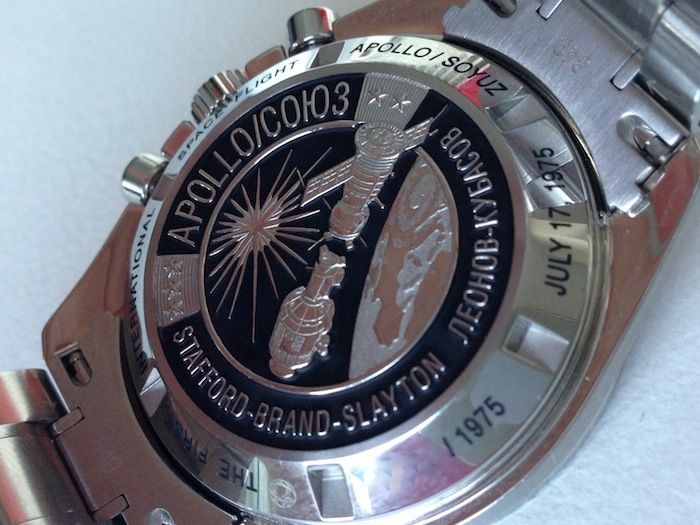 The number of the watch is engraved, as well as the date of the Apollo-Soyuz mission. The small OMEGA logo in a circle (Earth?) in there, just before the worth ‘The’ is there to make it a bit more difficult to re-produce similar casebacks. 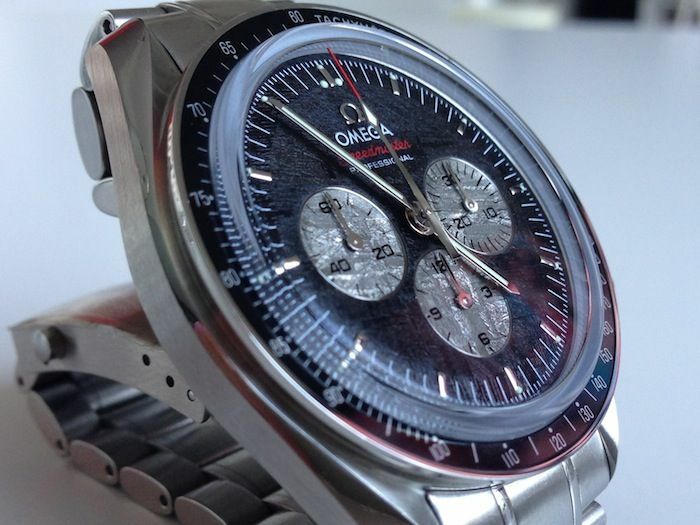 A measurement OMEGA took to fight replica watches. This marking is common for other models as well, but recently someone asked me what this was. 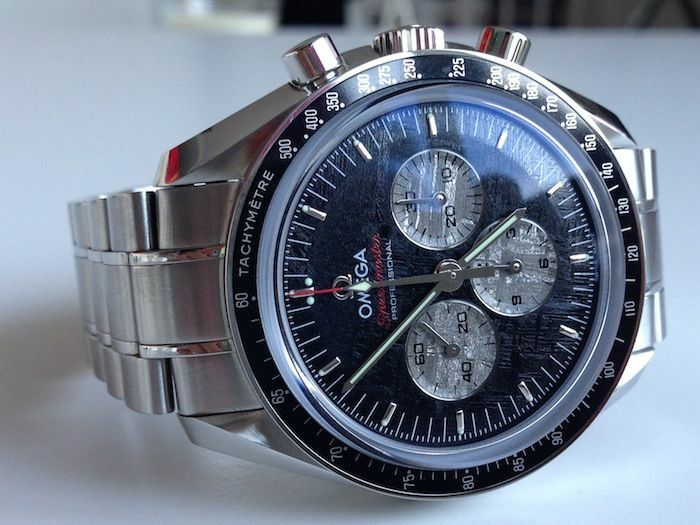 This OMEGA Speedmaster Pro ref. 311.30.42.30.99.001 came in a special Apollo-Soyuz box as you can see. A black leather box instead of the usual red one and printed with the Apollo-Soyuz mission patch logo. It can’t be seen in this picture, but the box has a nice meteorite color on the outside, as can be seen in my previous Speedmaster Soyuz review here. A big thank you to Darren Townend for submitting a number of Speedmasters (more next week). If you want to see your Speedmaster here on Speedy Tuesday, please contact us!